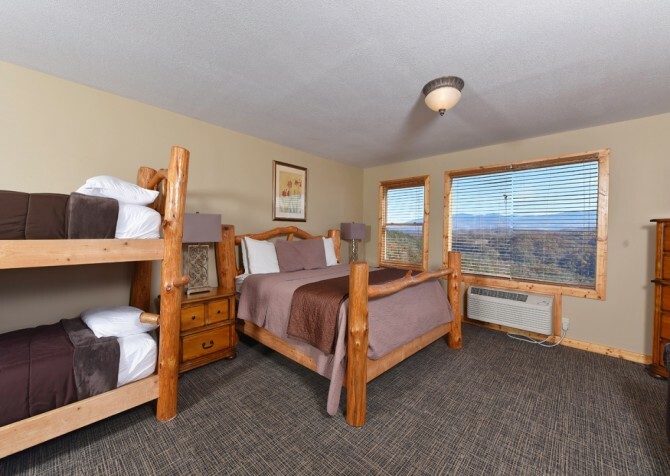 Boasting soaring mountain views, tons of comfortable seating, a huge game room, lots of awesome amenities, and room to sleep a staggering 46 guests, Crestview Lodge is a luxurious, spacious, and fun mountain cabin that accommodates any large group. It’s also less than 10 miles from downtown Pigeon Forge, so you won’t run out of things to do! 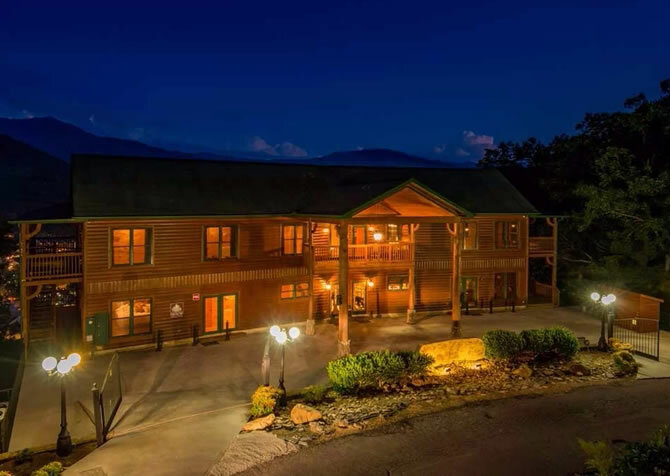 Located in scenic Pigeon Forge, TN, Crestview Lodge is an 8-bedroom, 8 1/2-bathroom cabin with room to sleep 46 guests and a wheelchair ramp at the front door. 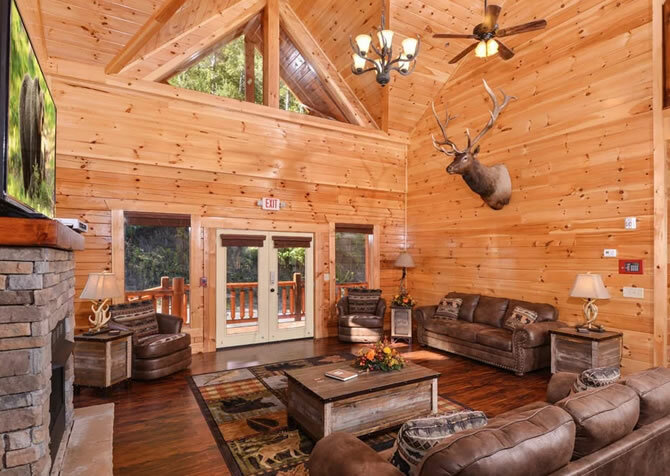 Whether you’re planning a church retreat, family reunion, or corporate trip, this large group cabin has space and entertainment for everyone! One of the most incredible features of Crestview Lodge is the spectacular view. 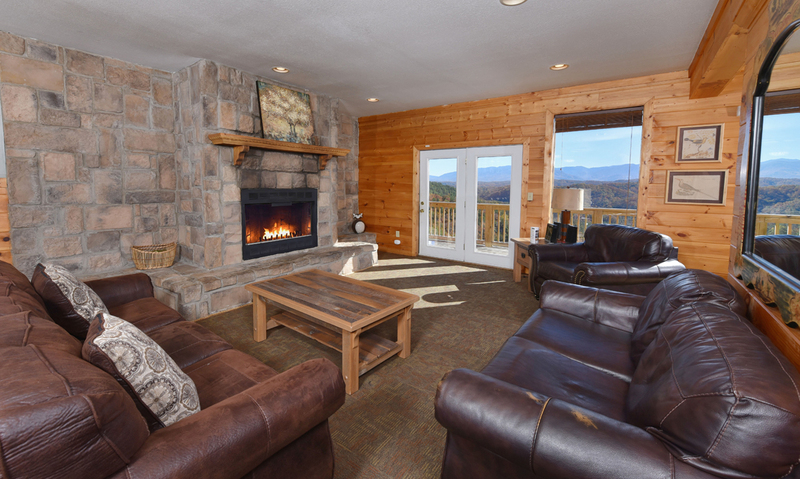 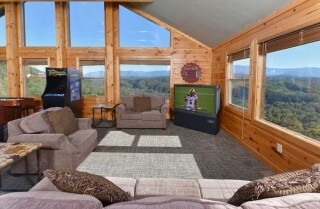 From almost every space in the house, guests can enjoy seemingly endless views of the Great Smoky Mountains. 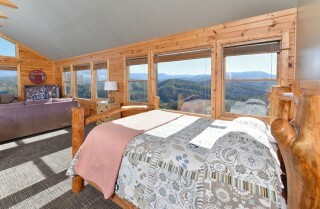 Of course, the best views will be found outside on the wrap-around deck. 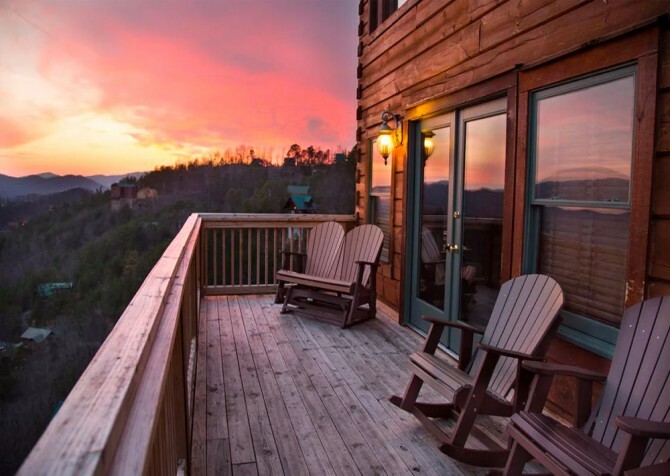 Along one side of the deck, several rocking chairs provide a good amount of seating. 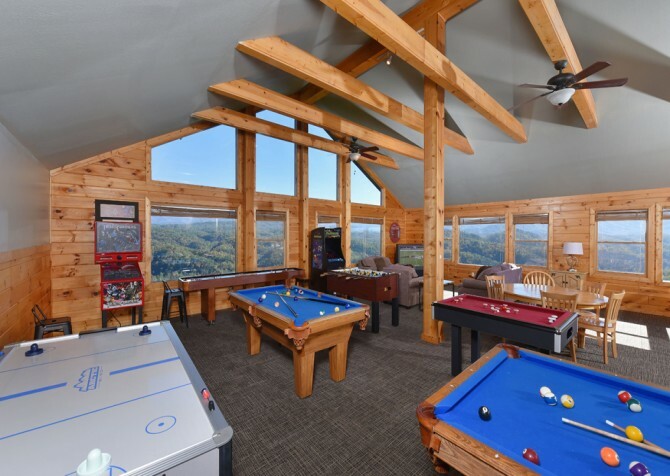 The other section of the deck houses a hot tub and a picnic table for outdoor meals and snacks. 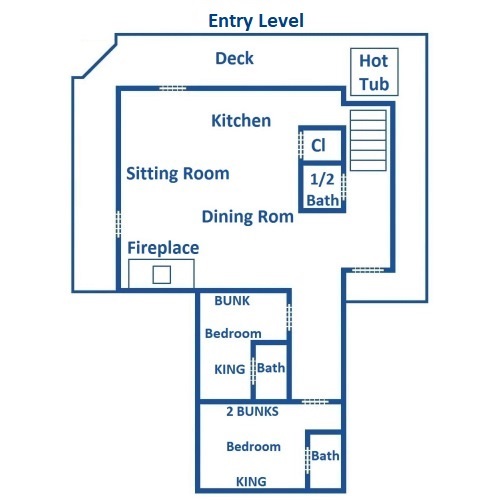 At the end of a long day exploring the city with your group, unwind with a relaxing soak in the large hot tub. 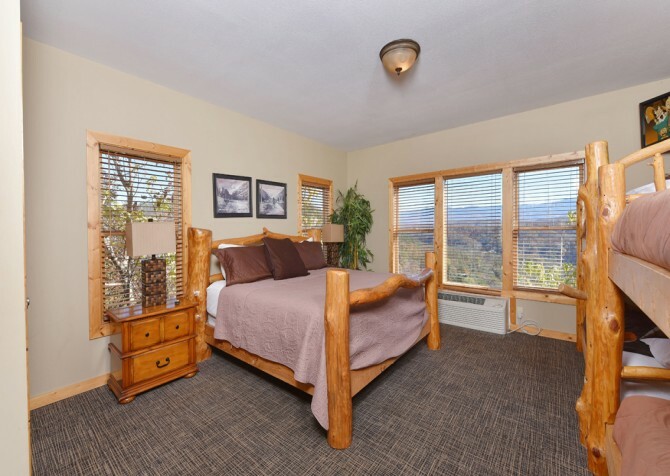 Throughout the year you’ll have fantastic mountain views – whether lush greenery in spring and summer or autumnal hues in fall. 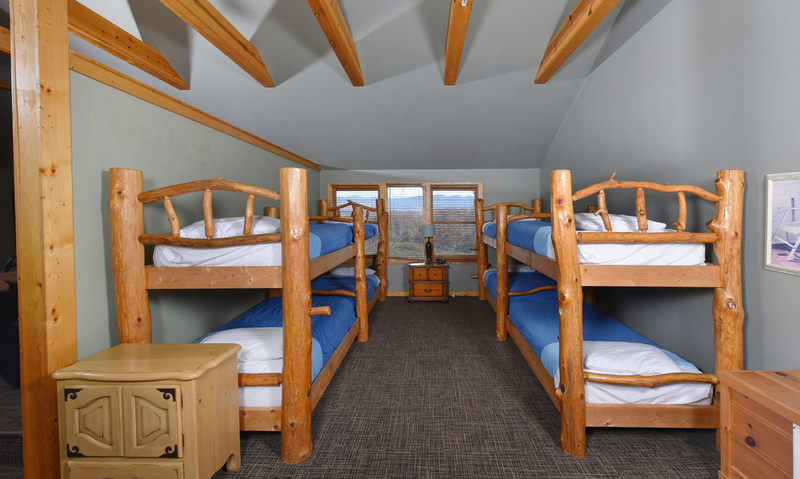 Inside the cabin, there is plenty to do and plenty of space to spread out. The 7,000-square-foot Crestview Lodge has tons of seating and lots of windows that keep the space feeling open. 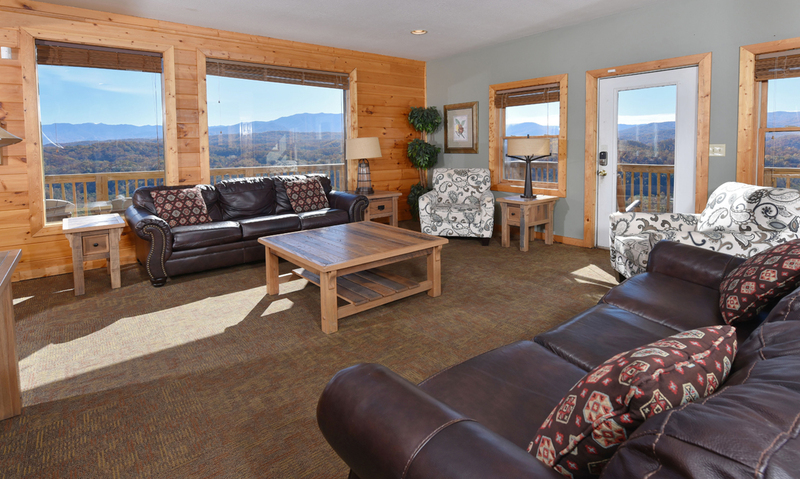 On the first floor, two cozy living areas feature plush sofas and more fabulous views. One living area has a large coffee table perfect for playing card games and board games, while the other has an inviting gas fireplace for guests to gather around on chilly nights. The third floor will certainly be one of the most popular places in the cabin. It boasts a huge rec room and a separate media room. 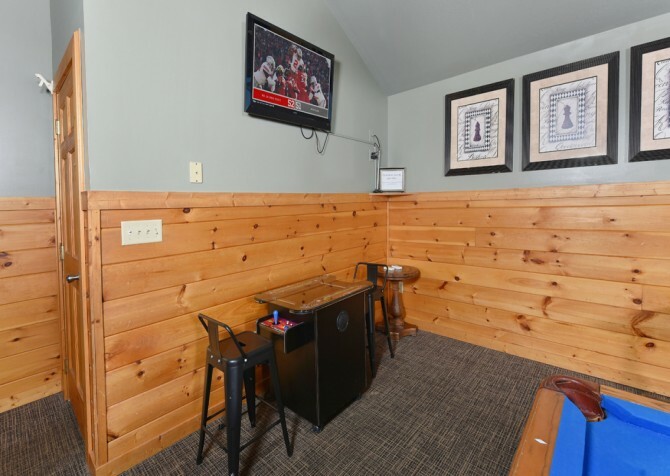 The rec room is the ultimate in fun for both kids and adults with a pool table, air hockey table, foosball table, a 14-foot shuffle board table, a bumper pool table, a pinball machine, and a basketball game for two! All of these are surrounded by floor-to-ceiling windows providing beautiful Smoky Mountain views. 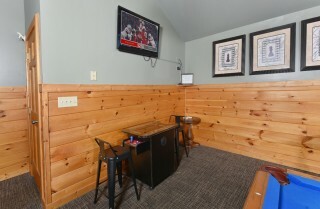 The rec room also offers plenty of seating. 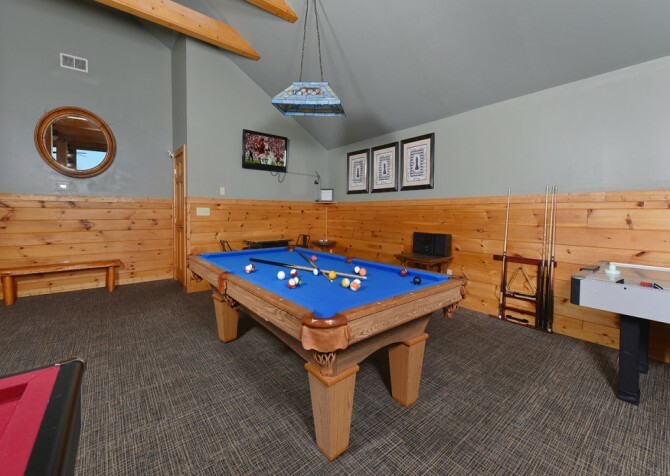 The pool table area has several chairs, a TV, and a CD player, while one corner of the room has comfy leather sofas and chairs, a large coffee table for games and snacks, and a big screen TV. 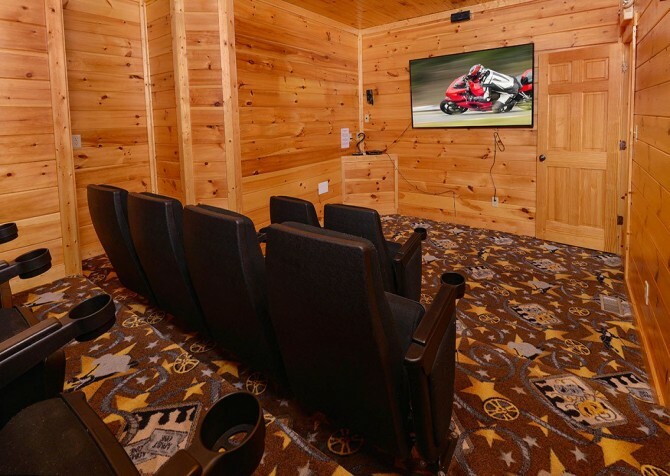 While there are lots of great things to do and see in town, you certainly don’t have to leave the cabin to have an entire day of fun! 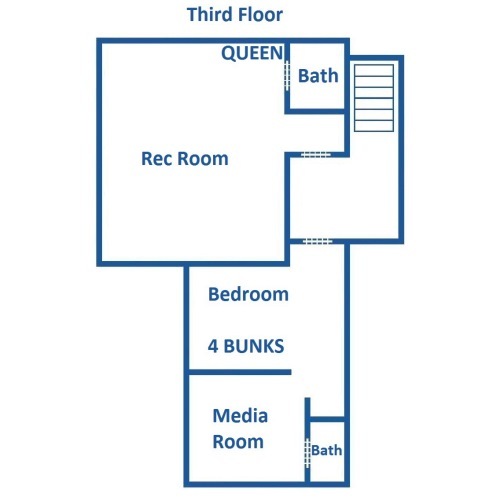 Two bathrooms are conveniently located on the third floor – one next to the rec room and one next to the media room. 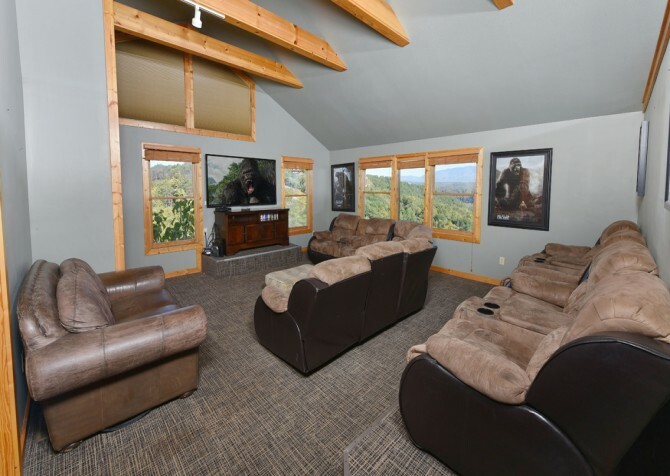 With tons of plush theater-style seating, the media room will be the place to go for watching a ball game or having a movie night. It is equipped with a 65-inch high-definition widescreen TV with DVD player, cable, and surround sound. 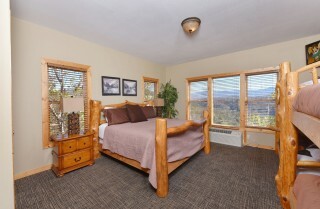 Best of all, guests won’t have to miss the view here either, with more floor-to-ceiling windows around the room. 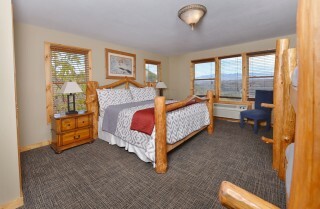 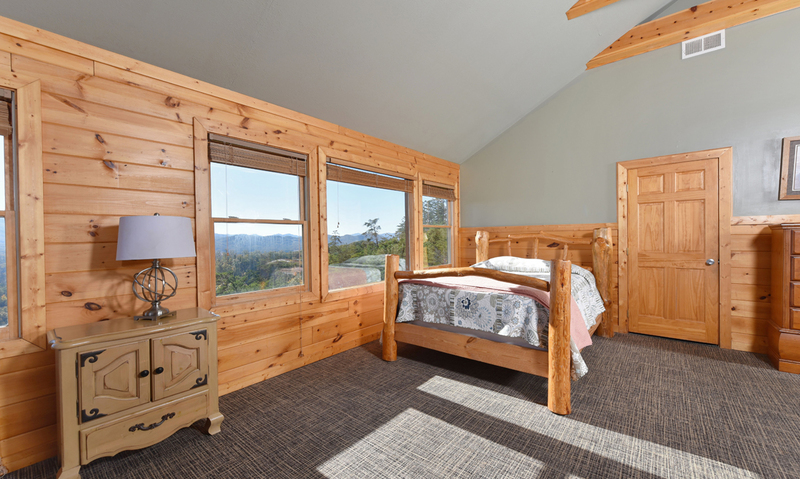 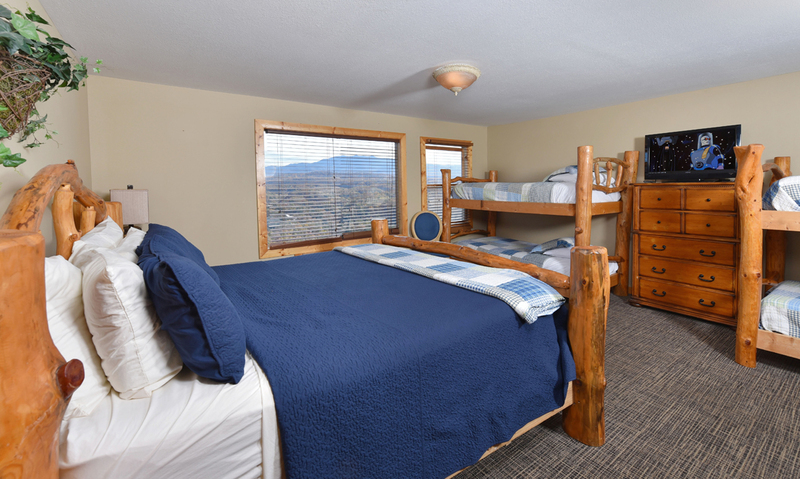 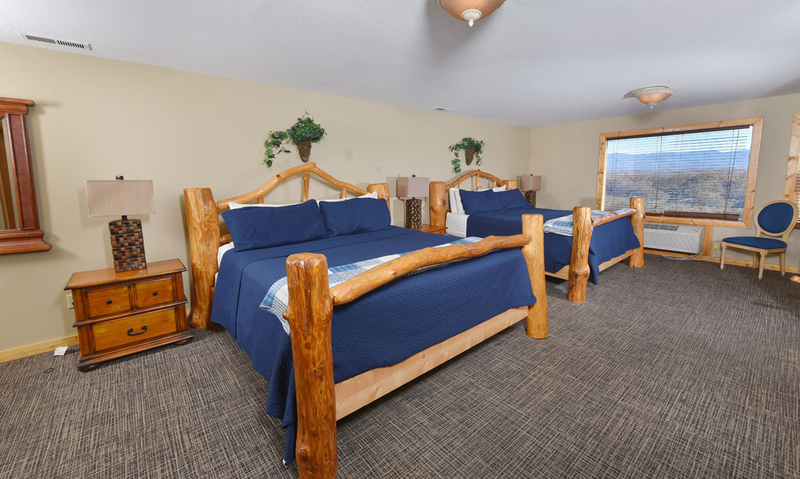 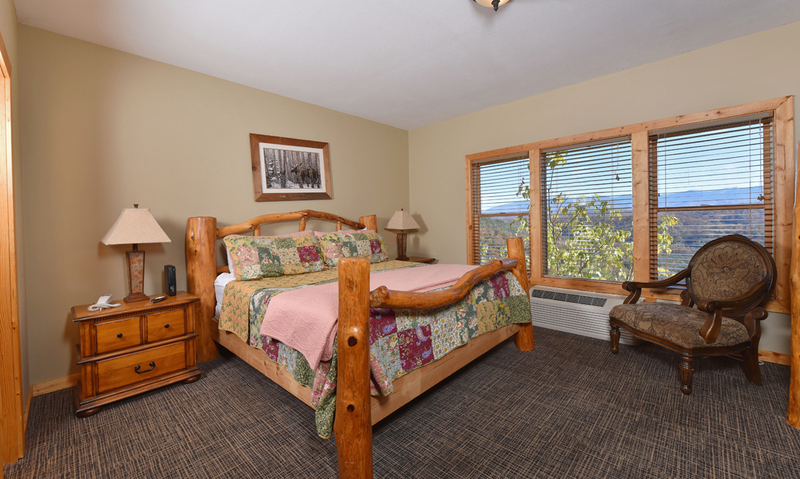 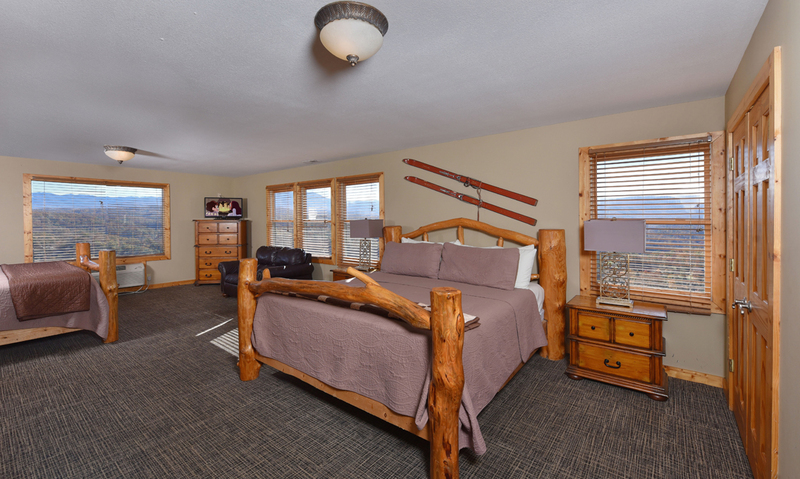 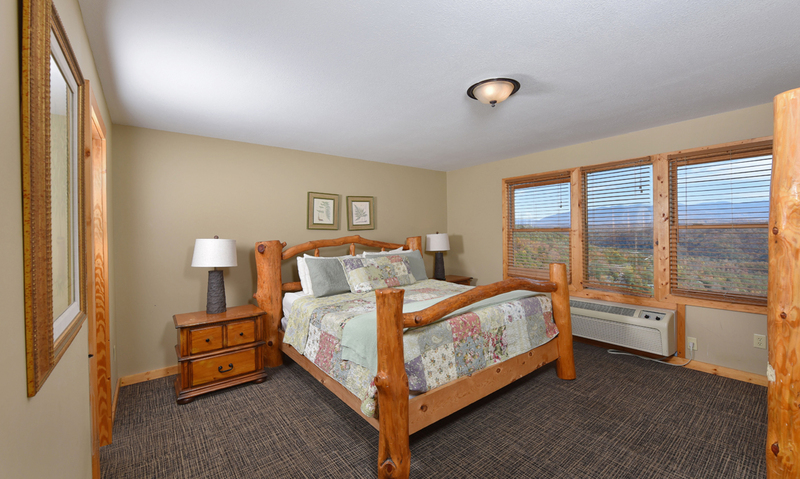 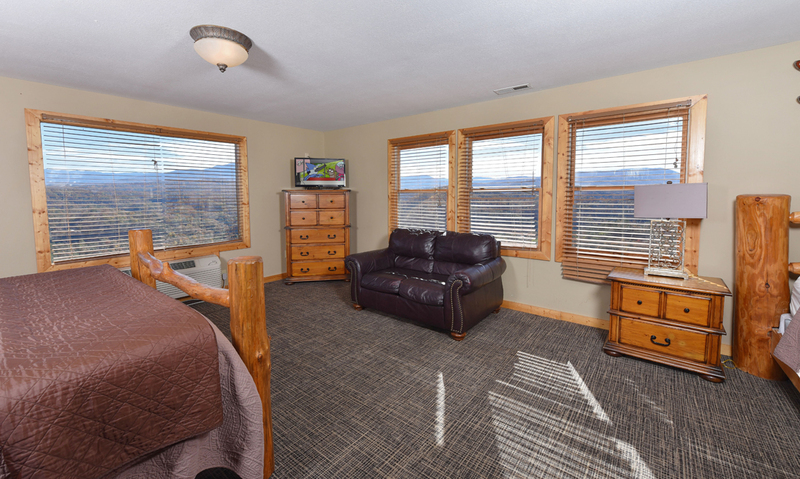 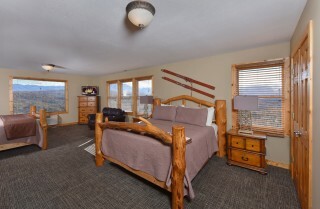 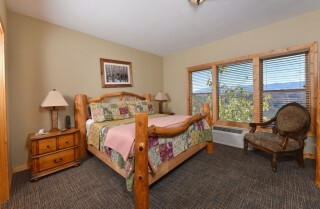 Each of the bedrooms in Crestview Lodge has comfortable and stylish bedding, and again, great views! 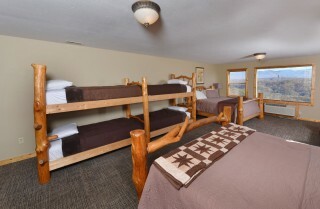 On the first floor, the two bedrooms have a TV, their own bathroom, and separate heating and air conditioning systems. 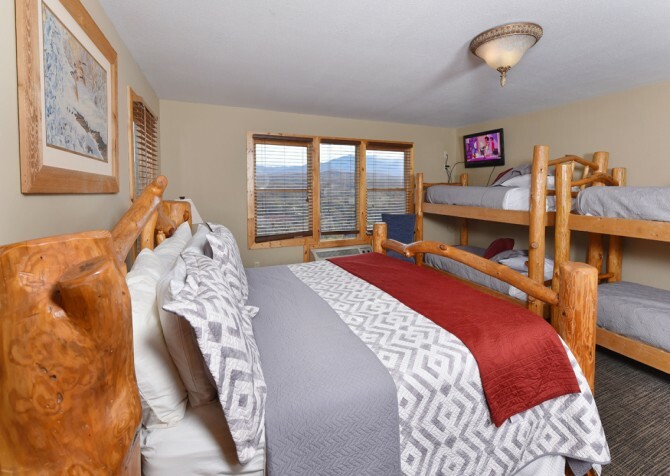 The four bedrooms on the second floor have their own TVs, separate heating and air conditioning systems, and their own bathrooms. 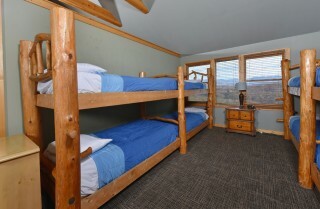 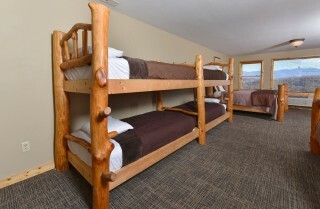 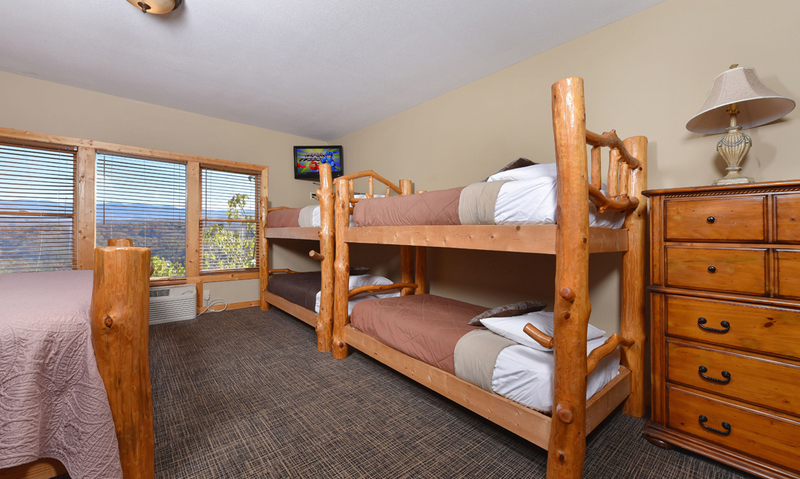 The third level has a bedroom with four bunk beds as well as a queen size bed in the rec room. In all, there are eight king size beds, one queen size bed, and fourteen bunks. With such a large group, you’re going to have a lot of mouths to feed! 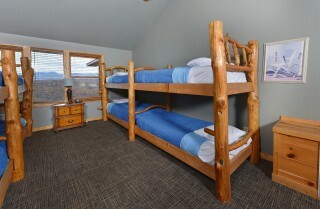 Crestview Lodge’s fully-equipped kitchen and spacious dining area are well outfitted for feeding everyone in the cabin. The beautiful kitchen features gorgeous views, lovely wood cabinets, stainless steel appliances, and all the essentials: two refrigerators, two microwaves, two dishwashers, two stoves, two coffee makers, two blenders, a toaster, and plenty of dishes, glasses, tools, and utensils. The dining room seats forty people. Just don’t forget to stop by the store on the way into town to pick up all the snacks and drinks you’ll need! 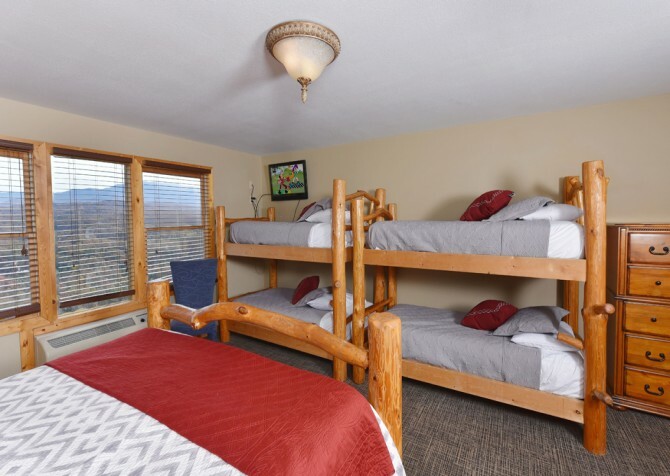 Crestview Lodge’s other amenities include: high speed Internet, a washer and dryer, parking for eight cars, and handicap features. 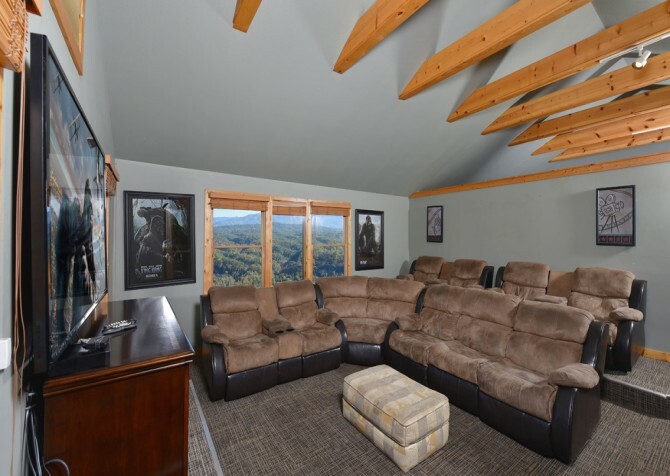 It is secluded on a one-and-a-half acre lot, but it’s not far from the fun attractions of Pigeon Forge, Gatlinburg, and Sevierville. Within 10 miles are downtown Pigeon Forge, Dollywood, Tanger Outlets, and Dolly Parton's Stampede. 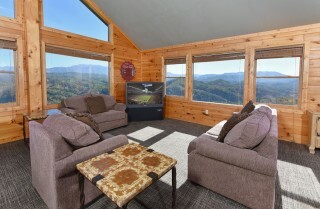 Downtown Gatlinburg, Ripley’s Aquarium of the Smokies, and Ober Gatlinburg are within 13 miles. 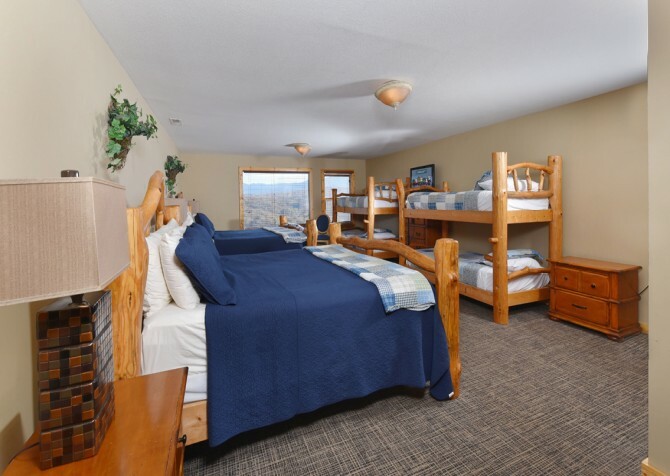 For a large group getaway, Crestview Lodge really has it all – space, views, entertainment, convenience, and comfort. 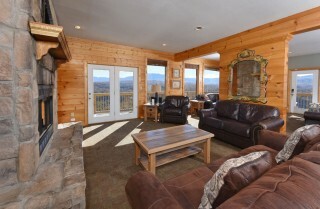 It will make for a truly memorable and exciting Smoky Mountain vacation! Call 1.800.684.7865 to book today! "The Crestview Lodge is an amazing cabin! 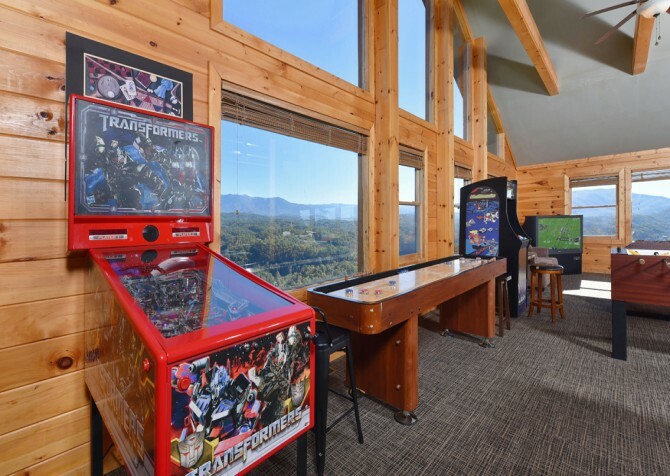 My family enjoyed the huge game room and the amazing view! The cabin was very clean and equipped with everything you need. 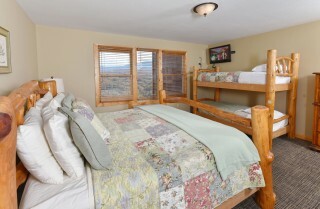 If you have a large family this is the place for you! 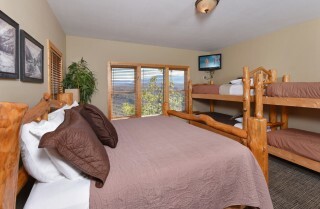 Beware of steep hills…"
"The Crestview Lodge is an amazing cabin! 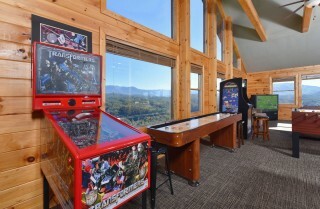 My family enjoyed the huge game room and the amazing view! The cabin was very clean and equipped with everything you need. 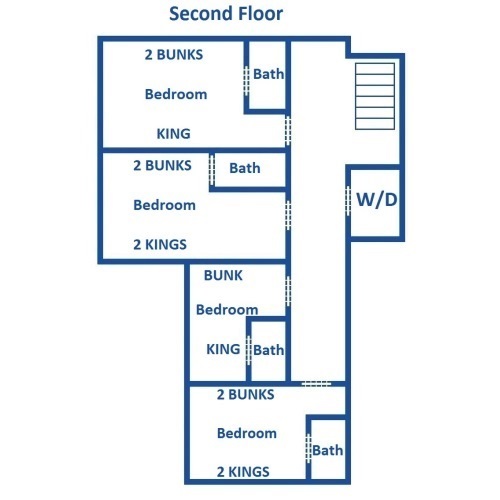 If you have a large family this is the place for you! 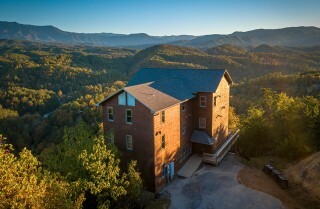 Beware of steep hills and narrrow roads!!!!!!!!" Thank you so much for this amazing review! 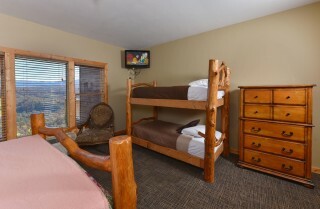 Were are so happy to hear that Crestview Lodge was a blast for you and your family! We can not wait to have you come stay with us again! 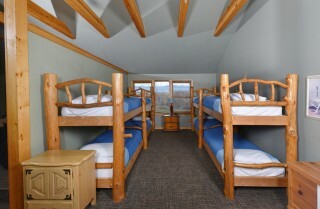 "Cabins For You ...is a great site to rent from...courteous...friendly...helpful! I stayed in several of their cabins over the years and they are always FABULOUS!"